Joining ARGYLE at Customhouse Quay this afternoon was the Northern Lighthouse Board's new PHAROS, like her a product of the Remontowa Shipyard at Gdansk in Poland. The last time these ships met was in fact when both were under construction. 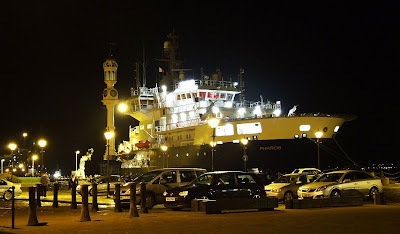 PHAROS, which has a similar sister ship working for Trinity House, joined the NLB fleet in March 2007, and was designed to service the 200 navigational aids in the waters around the Scottish coast, and around the Isle of Man. She is 84.2 metres long, and 3,569 gross tons. She has diesel electric drive, with two azimuth propellers, and together with her bow thrusters, she is capable of maintaining station using advanced dynamic positioning equipment.